Astronomers have spotted the fastest rotating star yet found, a massive and bright young star located in our neighboring dwarf galaxy, the Large Magellanic Cloud. 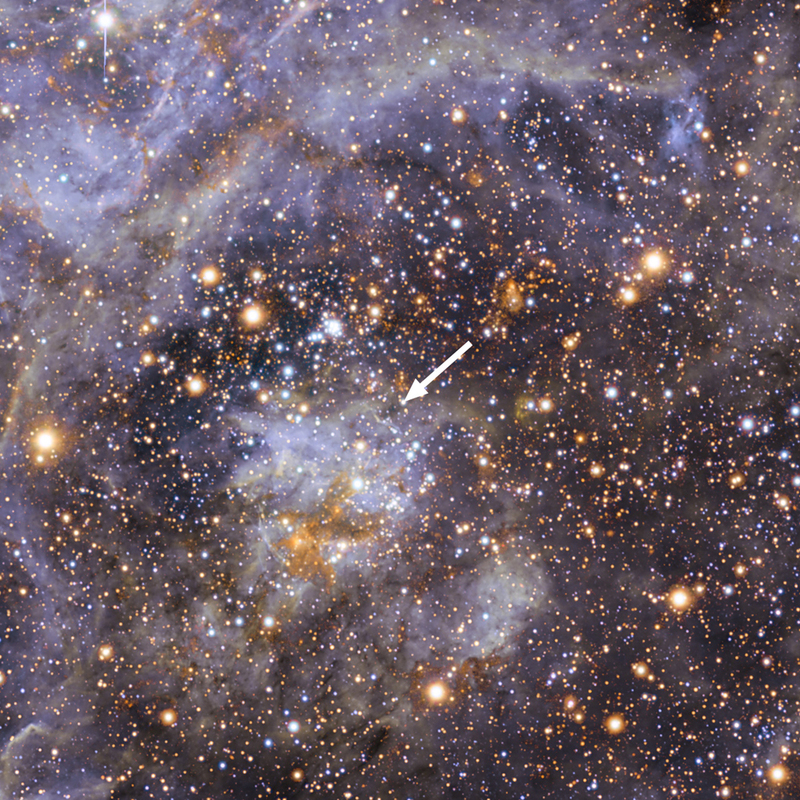 The giant star lies in the Tarantula Nebula, approximately 160,000 light-years away from Earth, and spins 100 times faster than the sun, at a dizzying pace of 1 million miles (1.6 million kilometers) per hour. The star, officially called VFTS 102, is approaching the point when it will be torn apart by centrifugal forces if it spins any faster. Based on their observations, the international team of astronomers thinks the star may have had a violent past and was likely ejected from a double-star system when its companion erupted in a supernova explosion. The scientists used the European Southern Observatory’s Very Large Telescope at the Paranal Observatory in Chile to detect VFTS 102. They found that the giant star is about 25 times more massive than the sun, and about 100,000 times brighter. The astronomers also noticed that VFTS 102 moves through space at a significantly different speed compared to its neighbors. According to researchers this speed discrepancy could mean that VFTS 102 is a so-called runaway star, one that has been ejected from a double-star system after its companion exploded as a supernova. So the astronomers will use NASA’s Hubble Space Telescope to make precise measurements of the star proper motion across space.